Bringing treasures from the coast to our mountains, this prestigious collection of duck decoys analyzed the careful craftsmanship involved in creating these beautiful sculptures, allowing them to stand alone as highly appreciated works of art. The exhibition was organized by our friends at the Cameron Art Museum in Wilmington, NC. Bruce Barclay Cameron began collecting decoys in the late 70’s. 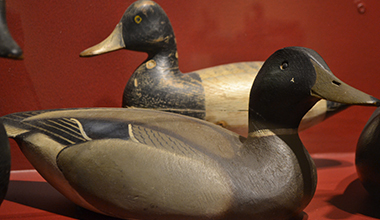 This exhibition highlighted a selection of Mr. Cameron’s most noted decoys and brought a collection of treasures from the coast to our mountains. Throughout his collecting, Cameron learned all about the careful craft involved in making one of these sculptures, from the nuances of the paint quality and form to the spirit of the bird itself. Each artisan took into consideration a love for the birds to really make these sculptures come to life, allowing them to stand alone as works of art that can be appreciated from all directions. Artisans included were A. Elmer Crowell from Cape Cod, MA; Joseph Lincoln from Accord, MA; Hucks Caines from Georgetown, SC; the Ward Brothers, Lemuel and Stephen from Crisfield, MD; Mitchell Fulcher of Stacy, NC; and Ned Burgess of Duck, NC.